In the evening I decided to move the adult female Diplocentrus bereai I keep, to a new enclosure. I kept the scorpion in one section (15 x 20 x 15 cm) of a fish tank (31 x 20 x 15 cm) divided in two sections with a piece of glass. Adult female Diplocentrus bereai on my hand. First I captured the very small scorpion in a plastic cup and moved it out of its former terrarium. 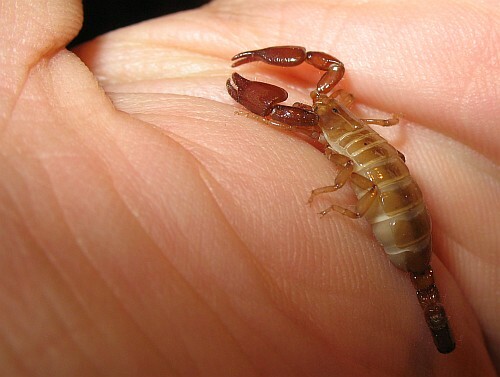 I moved the little scorpion from the plastic cup very carefully on my hand. In the above photo you can see the scorpion walking on my hand. 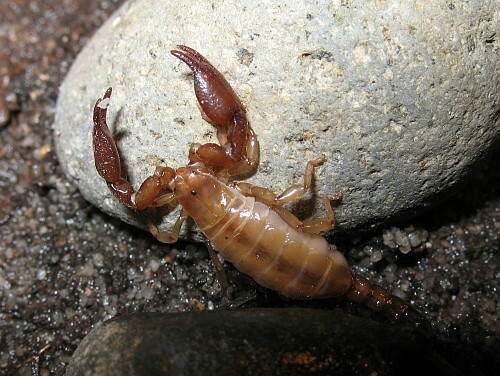 Compare the size of this female adult scorpion with an female adult beloning to the same family (Scorpionidae): Pandinus Imperator (photo below). 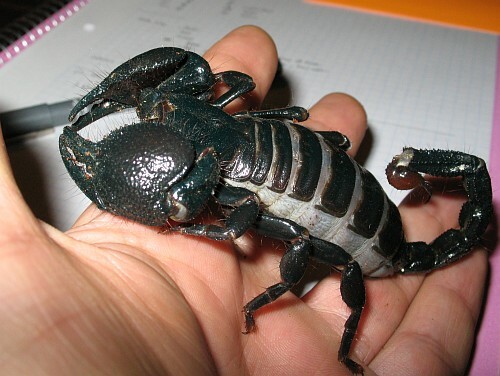 Adult female Pandinus imperator (Emperor scorpion) on my hand. Some time ago when I let it climb my fingers, it dropped down on my hand and used its stinger to anchor itself. So I was careful to not let happen this again, even though the experience was hardly painful. After a few more photos I put the little scorpion back in a plastic cup and started to work on making the new enclosure ready. I had decided to use a clip box (see: A scorpion enclosure for a Centruroides species) that was empty except for a layer of sand. It had been used in the past to house a Centruroides species from Tapachula, Chiapas. The substrate in the enclosure that used to house the Diplocentrus bereai consisted of a lot of organic material mixed with sand. For the new enclosure I used the sand that was already in it, and mixed it with some of the substrate from the old one, with a total depth of 4 cm. I used a water spray can to make the substrate very wet. A part of the Diplocentrus enclosure. 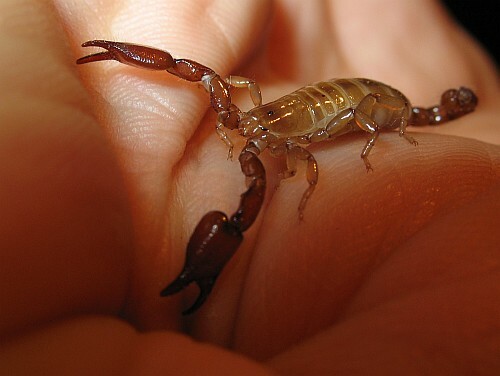 Almost 2 years ago the female Diplocentrus bereai gave birth to 17 scorpions. I managed to keep 6 alive, and they are still growing. Since I keep those babies on a substrate consisting mostly of sand, and they are doing great, even burrowing in it, I decided to use a very similar substrate in the enclosure which is going to house the mother. 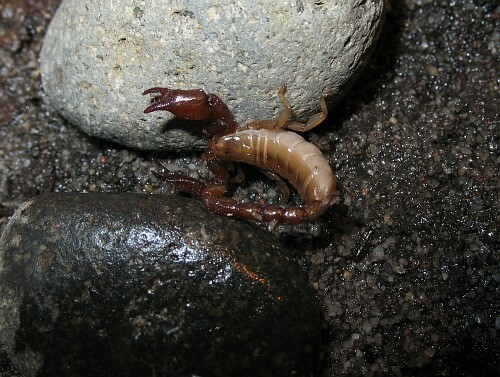 Releasing the scorpion in its new enclosure. 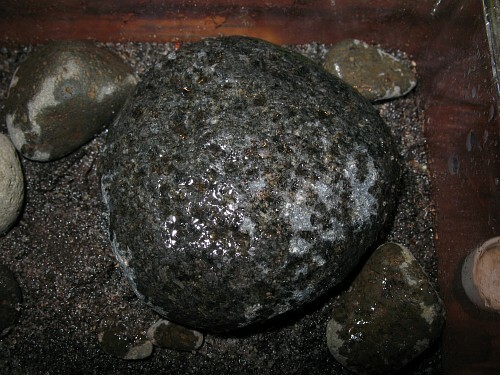 I added several small stones to the enclosure, and one large one. The latter I pressed firmly to the substrate, and removed the stone. Then I removed some sand from the mark the stone left, to create a hiding place for the little scorpion, and a tunnel leading to it, and placed the stone back. Diplocentrus bereai exploring its enclosure. I cut out a small square of the lid, 2.5 by 2.5 cm, which I covered with wire mesh glued in place (see A scorpion enclosure for a Centruroides species). Since I keep the juvenile Diplocentrus bereai in quite a moist environment, I decided to keep the ventilation hole of the enclosure of the adult female small in order to provide a similar environment. Also, because the substrate is kept much more moist, I have made a larger opening in the lid, 6 x 5 cm (also covered with metal wire mesh). Close-up of the Diplocentrus bereai. When the enclosure was finished, I finally added the small scorpion, and it immediately started to explore its new surroundings. 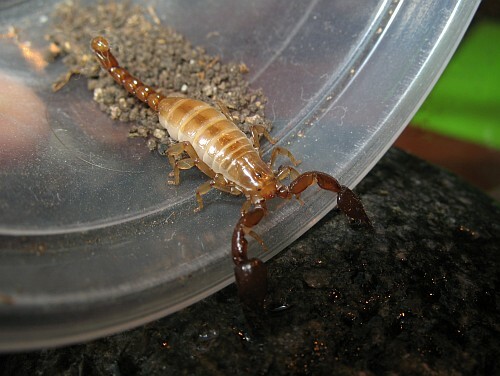 I like this scorpion a lot, but it's a pitty that she stays hidden most of the time.